Building your own shipping crate provides a much-needed flexibility in shipping large, expensive items. The materials are inexpensive and worth buying to protect an item that's worth a lot of money. 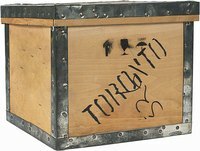 If the item isn't worth much, however, a shipping crate isn't worth the time and money. Assembly is simple and only requires a small amount of construction. This model is one of many options for building a crate. There are other materials and other layouts you can use to build an effective shipping crate (see Resources). Let's get started. Building the walls of the shipping crate is simple and requires a few 2-inch by 1-inch pieces of plywood. First, measure the item you want to ship. Add a few extra inches to each piece so there's room to add insulation if needed. If you want to make a square, 2-foot by 2-foot box, cut 16, 2-foot pieces of plywood--four for each side. To assemble a wall, hammer four, 2-foot pieces together--two pieces horizontal, two pieces vertical. If correctly done, there should be nine perfect, smaller squares between the plywood. Construct four of these walls. Once the walls are built, assembly is relatively simple. The trick is getting every wall exactly the same so their pieces match up. If even the slightest error in measurement is made, the crate won't come out right. To assemble, nail the end of the plywood pieces together. For each connection, one piece will be nailed on the long-side surface, one piece on the end of the plywood. Whichever you decide for each piece, be consistent so the measurements come out right. Nail together three pieces, leaving the top of the crate unattached. The box is almost done. Put the finishing touches on the box by tightening any loose boards and driving in any protruding nails. Place the item you want to ship into the box and put the proper padding around it to avoid damage. Once everything is in, nail the top onto the box. Your item is protected and ready to ship. Use a dolly or hand truck to cart the item. Don't try to pick up the box because you will be lifting the expensive item plus the weight of the box.